Watching a movie in single screens is such a different experience when compared to the multiplex viewings. There was the briefest break in the rains today and the theatre filled up in no time. Rajamouli, in his cameo, received a hero's welcome from the crowd. Nani received an even bigger welcome. And towards the end, when Raj Tarun made a guest appearance, the applause needed to be heard to be believed. Clearly, Kumari 21F has given the young hero quite some following amongst the masses. And when you watch a movie amid such a crowd, it is quite easy for you to get carried away. Add to it the fact that the leading man has already delivered one blockbuster last year and two decent hits this year. And that he is immensely likeable. Majnu, therefore, had everything going for it. Everything, except one wooden leading lady and some extended melodrama and an unnecessary comedy track that lands up nowhere. 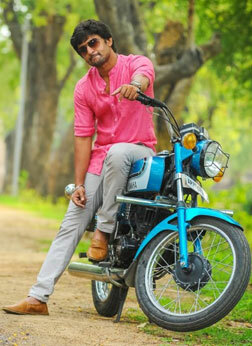 Plot first - Aditya (Nani) is an assistant director with none other than Rajamouli. He sees a girl Suma (Priyasri) one day, and decides to woo her. All goes well until she asks him if he has a girlfriend. He tells her that he had one but is no longer in love with her. Suma asks him for the details, and Aditya begins to tell her about his story with Kiranmayi aka Kiran (Anu Emmanuel). Halfway through his narration, he realizes that he is still in love with Kiran, and sets out to woo her back. The film is a regular love triangle with the hero loving one girl, circumstances forcing him go out with another, and the first girl coming back later. Added to that are the emotional turmoil that each character is shown to undergo and a couple of comedy tracks. Director Virinchi Varma plays safe and does not try to deviate too much from the formula. Of the two love stories, the one with Anu Emmanuel works well, while the one with Priyasri is ho-hum. The comedy track with Vennela Kishore works very well, but the other one with the Gabbar Singh gang fails. On the whole, the first one works well, and the second one yo-yos. Nani has lost all the flab he had put on earlier and looks like his old self. He acts like only he can, and handles comic, romantic and emotional scenes with some élan, taking the overall watchability of the movie up several notches. Anu Emmanuel looks beautiful in some frames but her dubbing lets her down. Priyasri does not let anyone else let her down - she takes that upon herself. The supporting cast do well and play their roles out just to the right pitch. The film's music is pleasant, and the fact that quite a few of the songs play out in the background is good. The production values are quite tacky. Whenever Anu Emmanuel gets on a bike, you can clearly see she's not riding it and just sitting there. The hero and heroine meet in a café in Hyderabad which has brightly painted aluminium chairs - the types that you get from tenthouses. Clearly, there could have been a bit more care taken there. Apart from these grouses, Majnu is a definite one-time watch. Some good comedy sequences and an in-form Nani help this middling triangular love story stay afloat. Be the first to comment on Majnu! Just use the simple form below. fullhyd.com has 700,000+ monthly visits. Tell Hyderabad what you feel about Majnu!